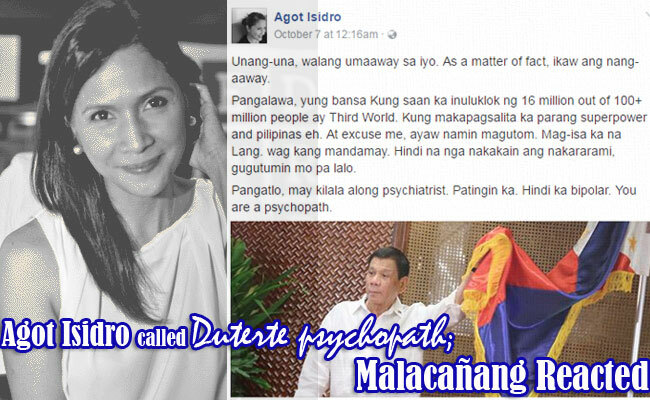 Ang Probinsyano actress Agot Isidro posted her inevitable anger towards President Duterte through her facebook account. On her update last October 7, she called Duterte a “psychopath” when the president threatened to withdraw the county’s relationship with the United States and European Union. At the start of her post, she told the statesman that no one is arguing with him but as a matter of fact, he is the one who’s picking a fight. Philippines is a 3rd world country where 16 million people voted for him and many were suffering from hunger. He must think about them first before himself. On her last post, he suggested Duterte to see a psychiatrist for she thinks that the president is a not a bipolar but a psychopath. Isidro also commented that he is crazy to news where Duterte compare himself to Hitler. At dawn, the actress’ post was still in public but this morning, it became private and nowhere to be seen on her timeline. Her post garnered 6,100 shares with more than 18,000 comments. The facebook account of the actress can be hers as it follows her friends at the entertainment industry. During the elections, Isidro publicly endorse then Vice-presidential candidate Leni Robredo but she refuse to reveal her presidential bet. The singer-actress became a trending topic this Sunday morning where netizens have different opinions about Isidro’s outburst. Netizen kuyakuyakoy commended Isidro’s courage to criticized Duterte while Cecilia Sy described the actress as an embarrassment for patriotic Filipinos. Presidential spokesperson Ernesto Abella was then asked for their opinion regarding this matter. He told the media that Isidro has the freedom to voice out her opinion. Abella added that the president just wants the country to become economically and mentally independent. Meanwhile, Office Secretary Martin Andanar said that the government still welcomes the aid if foreign countries.